This may be cliche to some, but not to me. I’ve seen it. Many times. Just the other week, I saw a group of children–preschoolers–play at the airport, in the space between gates with flights departing to globe spanning destinations. Some among the handful of kids spoke different languages, and none of them knew each other until a moment prior. Nonetheless, there was a long wait to be had, a few empty water bottles, a ribbon to pull, and play-ready age-mates to pass the time with. So they found a way. Their giggles filled the space with the ripple of childhood joy that knows no borders, religion, nationality, language, tradition, or race. Adults sat nearby, keeping an eye on their child with a little less wariness of each other, now that their young ones felt so at ease. After all, these were just children playing together: they were not political statements or status symbols or religious flagships. They did not carry burdens of group-mentalities or dogmas or beliefs. It was okay to just be. To share a moment. And a smile. For the adults, too, smiled. A careful, half-lip smile, weighted by whatever notions and knowings, history and worries adults often have for those they do not know and whose language they don’t understand. A half-smile it began but it grew warmer when eyes met following a child’s antic, a cute gesture, a silly face, a giggly laugh. Like the children, the adults smiled the same smile in every language. 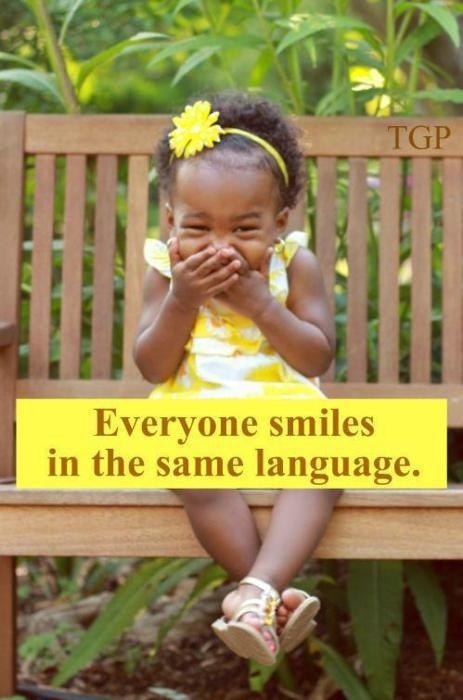 Or rather, they smiled in one language–the one we all recognize and know by heart. The language of humanity. The language of a smile. Beautiful notion and very well written! Yes, Bryce, we do! Thank you for adding that–so important to remember, in this divided world of ours, that we are–basically–all the same, all human, all needing of the same things, and all of us were children who could play with others, language no matter, joy unencumbered. What a delightful example of nonjudgmental transcendent communication before fears and prejudices have a chance to kick in. Children have to be taught to hate. We have much to learn from them. Exactly, Sonnische! Hate is a learned behavior, not an innate tendency, or a necessity in anyone. It is up to us to not transfer it to our children, and to find compassion in ourselves to recognize our own prejudices and undo them.